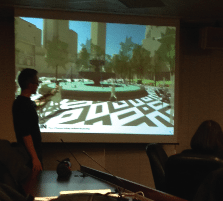 The plans for upgrading Berczy Park and its centrepiece fountain go on public view at St. Lawrence Hall Mar. 11 7-9 pm to hear community desires for that important gateway to historic St. Lawrence Neighbourhood. Claude Cormier et Assoc., Montreal landscape architects, have proposed a unique design featuring cast-iron statues of dogs orally spraying water from varying distances from outside into a double-sized fountain. Many features are cited, but none are engraved in stone or iron and the final design is to be determined by community members and the city. The design features diagonal paths that dissect the park from all corners, converging at the fountain. The fountain itself will be retained and more than doubled in size to encourage children’s interaction such things as boat sailing. The fountain gets more spray jets, a lower rim and possibly a dramatic centerpiece which could include a large public artwork or sculptures. Low mound-like hills will be placed around the park to add a nature element and hush city noise. Seating would include movable seating (tables and chairs around the fountain) and long rows of wooden benches along the pathways. Trees would include a double row of London Plane trees along Front St, a double row of Horsechestnut trees along Wellington, and Red Oak trees bordering Scott St. Lighting would be added through the park, using the Old Town Toronto style post or gaslight posts. The Derek Bassant mural on the Flatiron Building would be maintained (although current mature trees might be felled to improve the view of the mural) and the small Berczy family sculpture in the western park would be relocated to increase its prominence. A new public artwork would be added to encourage public interaction and children’s play. The art could be part of the fountain or appear elsewhere to serve as a children’s play area focus. An open flat activity area (or potentially a dog area) would be added behind the Flatiron Building to be used as an on-leash dog area where pet owners can interact and ideally divert some of the current dog traffic away from other areas of the park. To learn more about the proposed new gateway park to St. Lawrence Neighbourhood, visit berczy.wordpress.com.